A month later, Michael Lewis published Flash Boys and finally explained to the common person (if not corrupted, captured and purchased SEC regulators) what we have been pounding the table since 2009: that as a result of HFTs, markets are now two-tiered, unfair, broken, fragmented and manipulated in broad daylight, and since the HFT lobby controls the SEC, nothing will change. Subsequent to Flash Boys, Virtu decided to pull its IPO due to the backlash against algorithmic rigging. However, now that a year has passed, and the S&P is some 400 points higher, thanks mostly to that other master market rigger, the Federal Reserve and its central bank peers, everything has been forgotten and forgiven. After all, who cares if the market is rigged and broken if as a result it goes higher, right? Which brings us to yesterday, when Virtu decided to give its IPO another go, and filed an amended S-1, in which there was nothing really new: all the same rigging strategies remain, and were not only not punished, but were rewarded with $723 million in revenue in 2014. But the punchline, and the reason why the joke continues to be on everyone else who still believes in “fair and efficient markets”, is that Virtu just updated its trading record for 2014. 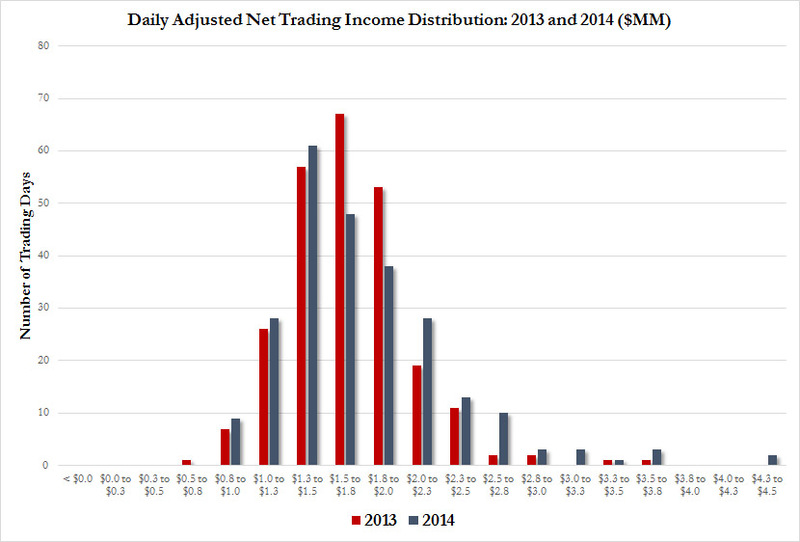 Actually not only did Virtu not have a trading day loss in all of 2014, but on its “worst” trading day, the firm made “only” $800,000 to $1,000,000, the highest “worst” bucket in its history, suggesting that even as trading volumes continue to collapse, Virtu gets more and more aggressive with its “strategies”, something that can be seen on the chart below showing the increasing prepondrance of higher profitable trading days in 2014 vs 2013. Which is just a lot of fancy words for perfectly legal, regulator-endorsed and risk-free frontrunning of legitimate trades. 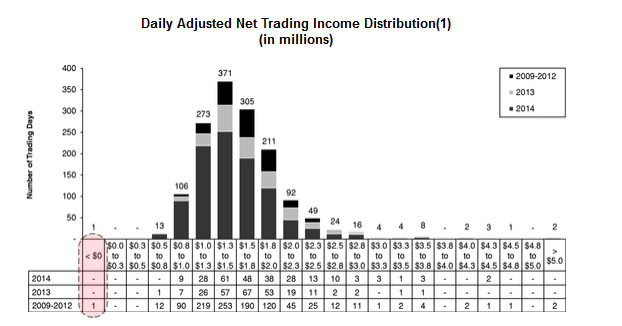 And just in case the punchline was lost in all that, here it is again: Virtu made money on 1,484 of 1,485 trading days.